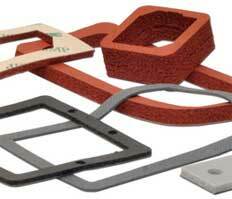 Electrically conductive gaskets and electrically conductive gasket materials are typically specified for EMI applications. Commercial EMI applications often call for nickel graphite filled silicone due to cost, whereas military and aerospace applications often call for silver coated aluminum to meet Mil-G-83528C specifications. Military or aerospace may also use fluorosilicone vs. silicone for its fuel and chemical resistance. Commercial applications more often specify nickel coated graphite for its cost savings. Most EMI applications can be satisfied with Ni/C products such as SNE-554, EC-2130, EC-2040 or SNEF-60. The tan material in the video has silver coated aluminum particles, the dark grey material is nickel coated graphite. The video offers a simple visual of the rubber’s conductivity. The last example is showing a 3M conductive adhesive, the conductive path is from flows through the metal plate, up through the adhesive, through the conductive rubber into the LED. For applications assistance or more information about electrically conductive gaskets and electrically conductive gaskets and gasket materials, EMI gaskets and EMI shielding materials, or call Stockwell Elastomerics at 215-335-3005 or complete a contact form for assistance.